For a week, BMWBLOG had the opportunity to test drive over 1500 kilometers the super-sporty BMW M135i hatch. The xDrive variant of the hot-hatch served us well on our road trip to Geneva and through the Alps, but more on that in our test drive review next week. 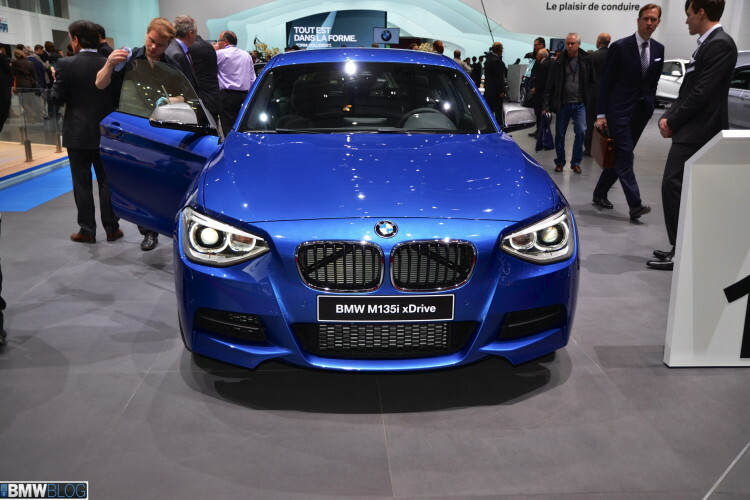 Among an impressive lineup of bimmers at the 2013 Geneva Auto Show, we laid our eyes on the M135i xDrive painted in the Estoril Blue color. Powered by a 3-liter, straight six-cylinder engine, the M135i produces 235 kW/320 hp and 450 Nm of torque at 4,500 rpm. The technology package includes a TwinScroll turbocharger, direct High Precision Injection with central multi-hole injectors, VALVETRONIC variable valve control and Double VANOS variable camshaft timing. The BMW M135i sprints from 0 to 100 km/h in just 5.1 seconds (automatic: 4.9 seconds) and reaches a top speed of 250 km/h. Average fuel consumption in the EU test cycle is 8.0 liters (7.5 liters)/100 km, but we found those numbers to be slightly higher, mainly because we pushed the car quite a bit. One non-metallic and five metallic colors are available for the M135i model. The standard interior features Satin Silver trim and upholstery in Move cloth design. Optional interior trims and seats upholstered in Dakotaleather (offered in two different BMW colors) are also available. The interior details include exclusive cloth Hexagon/Alcantara upholstery, an M leather steering wheel with multifunction buttons and blue accent stitching, the BMW Individual roofliner in Anthracite, interior trim in Aluminum Hexagon with matte Estoril Blue or high-gloss black accent lines, gear selector and handbrake with leather gaiters, M driver footrest, speedometer and rev counter with red chronoscales.